TAMPA, Fla. -- Doñana National Park is a marshy mud flat on the southwest coast of Spain. For all but six weeks out of the year, it is covered in water from the rivers that flow into the Atlantic Ocean, which lies just beyond a string of dunes. When the water recedes, it leaves a dusty landscape with very little signs of life. But it’s not what is on top of the ground that has the world transfixed these days -- it is the mystery of the lost city that some believe lies beneath. And it is a mystery that USF Professor Philip Reeder is playing a major role in solving. Since Plato etched his immortal story of a spectacular city that fell into the ocean, the lost city of Atlantis has captivated the imagination. Reeder is part of an international research team lead by famed archaeologist Richard Freund that has drawn startling distinctions between anomalies underneath the marsh in Doñana and the clues Plato left in his writings about Atlantis thousands of years ago. From its geographic location near the Straits of Gibraltar -- known in ancient times as the Pillars of Hercules -- to the three concentric rings of the same dimensions Plato described as being unique to Atlantis’ construction, scientific ground surveys conducted by the team seem to bear a striking resemblance to Plato’s one-and-only description of the lost city. Is what’s buried beneath the Spanish marsh definitely Atlantis? Not so fast, Reeder cautions. “I wouldn’t venture that,” said Reeder, whose research has taken him through an adventuresome list of archaeological digs from the ancient Holy Land to the site of Nazi atrocities at Sobibor. Their work on the Doñana site has been ongoing since 2009, but recently has garnered international attention with the airing of the National Geographic special Finding Atlantis this month. Freund and Reeder have been frequent collaborators on a number of projects related to Freund’s leadership of the Greenberg Center for Judaic Studies at the University of Hartford. The team has worked together searching for ancient Judaic sites in Israel and searching for the remains of the oldest synagogue in Spain. The team -- which also includes historians and geophysicists from across the U.S. and Canada -- often tackle projects with great mysteries attached to them, such as exploring the mysterious Cave of Letters, believed to have been used as a hiding place some 2,000 years ago by Jewish refugees escaping the Romans. Another project seeks to explore an area of Egypt traversed by Moses and the tribes of Israel in the Exodus. Their goal is to shed new light on history and to balance the legends handed down through time with scientific fact -- no small task given that in the thousands of years people have been talking about the lost city of Atlantis, determining whether it is one of the world’s great tall tales or an epic human disaster has yet to be settled. Working with Spanish archaeologists and geologists and with the National Geographic film crew in tow, the group set out to determine if in fact there are buried structures beneath the Doñana marsh and if they could date back 4,000 years -- the era in which, according to Plato, Atlantis existed. Legends and a great philosopher aside, it is a task now heavily reliant on technology, which is Reeder’s specialty. The professors use Global Positioning Systems, laser survey instruments and electrical resistance tomography to explore on and beneath the ground without disturbing it. The Spanish government has protected the thousands of acres of the national park since the 1960s; the area’s fragile coastal marshland is a sanctuary for migrating birds and home to four threatened bird species, including herons. 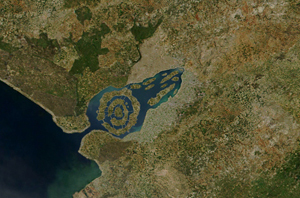 Since the 1920s, explorers have speculated that the area might be the location of the former grand city of Atlantis, said by Plato to be elaborately built on three concentric circles with harbors separating the rings of land. Two rectangular temples, one dedicated to Poseidon, were to be in the city’s center. Given the seismic activity in and around that part of the world, the idea that an earthquake may have set off a tsunami that drowned the city is eerily plausible, especially given recent events. Interest in the legend’s possible connection to this area was revived nearly a decade ago when satellite images produced by a German scientist of the dry marsh picked up on what appeared to be circular structures buried not too far below the ground. Reeder points out that adding to the weight of evidence is the discovery of possible “tribute cities” 200 kilometers to the northeast in Spain built in the image of Atlantis by those believed to have escaped the calamity. Drilling very small holes of just a few inches across, the explorers were able to detect the pockets of methane gas and wood about 13 meters below ground, Reeder said, indicating the decomposition of large amounts of organic material. Sensor readings also indicate anomalies underground, but exactly what that means requires much further testing. The anomalies could represent layers of decayed adobe bricks from a buried city, Reeder said. Proof could come from excavation and chemical analysis of materials unearthed through those very small drill holes. Ground-penetrating radar often used to locate large and deeply-buried objects and spaces didn’t work on the site because the high level of salt in the soil interrupted the signal, Reeder added. In the meantime, their work has given the legend of Atlantis new life. For his part, Reeder isn’t drawn into the hype and won’t let his imagination run wild either. “Given the preponderance of the evidence on the geophysical plots and lines, I feel there is definitely something there,” he said, peering over his wire-rimmed glasses in a manner any good adventure novelist might script.